Big Banks Boost Fees Again: What Are You Going to Do About It? 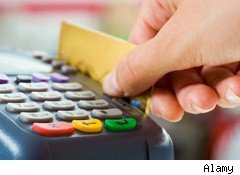 Bank of America's (BAC) announcement this week that it would start charging a monthly $5 fee for using a debit card to make purchases is the latest in banking industry upcharges for services. In addition to debit fees, ongoing hikes in overdraft and ATM charges mean fewer fee-free options for banking services, and increased balance requirements to get them. The bottom line is that consumers are now paying more to use their own money. Other large U.S. banks, including Wells Fargo (WFC), J.P. Morgan Chase (JPM) and SunTrust (STI) are testing or planning monthly debit fees, according to Reuters. Citibank (C) has not announced a plan to charge for debit card use, but it has increased fees for checking accounts with low balances, and increased balance requirements for free services. For example, starting in November, holders of Citibank's EZ Checking accounts will have to maintain a balance of $6,000 across linked accounts or pay a $15 monthly fee. Free checking accounts are increasingly rare. Two years ago, 76% of non-interest checking accounts were free. That figure has now dropped to only 46%, according to a recent survey by Bankrate.com. The survey also reported that overdraft fees are now an average of $30.83 and the average out-of-network ATM fee is $3.83. The rising fees reflect the big consumer banks' efforts to offset billions in predicted losses due a fee-cap on merchant-processing fees under the Durbin Amendment. The new law goes into effect on Saturday, and caps interchange fees at 24 cents a swipe, previously that averaged 44 cents. The net effect of higher fees for consumers, whether for debit card use or banking services, is especially troubling for younger people with lower incomes, says Andrew Schrage, 25, a personal finance blogger at MoneyCrashers. "These fees can severely hamper workers' ability to accomplish essential goals like saving for retirement or working to build an emergency savings fund," he said. But the fees may not be a game changer for the debit card business, said Greg McBride, senior financial analyst at Bankrate.com. At least not yet. "Fees are an exception, not a rule, and savvy consumers are not going to stand for new fees and higher fees," he says. "A lot of consumers will do a different method of payment or take their business elsewhere." His theory is that consumers will move to smaller or online banks, with lower fees, or use cash more often to avoid debit card and other fees. According to the FDIC there more than 6,350 commercial banks in the United States. The debit swipe fee changes only affect institutions with at least $10 billion in assets -- less the 2% of them. For consumers trying to navigate the new minefield of higher debit charges, the options include switching back to cash, using credit cards, or changing to a bank with lower or no fees. At DailyFinance, we'd like to know how these fees affect you, or if they've caused you to change your spending habits. Please share your experience in the comments section. Catherine New is a staff writer with DailyFinance. You can reach her at catherine.new@huffingtonpost.com.